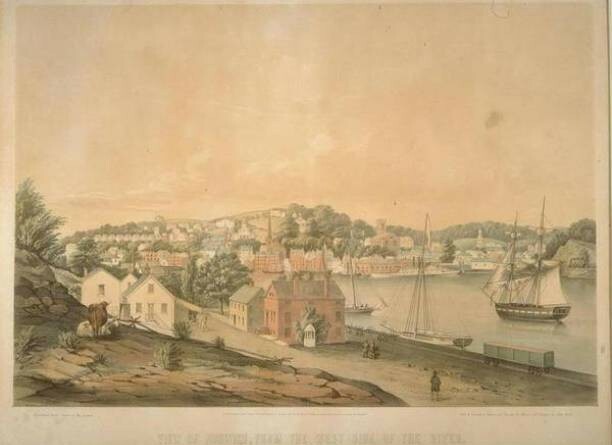 In the late 1800s, panoramic illustrations, known as bird’s-eye views, became a popular means of portraying towns throughout Connecticut as the industrial age transformed them from agrarian hamlets into booming economic centers. 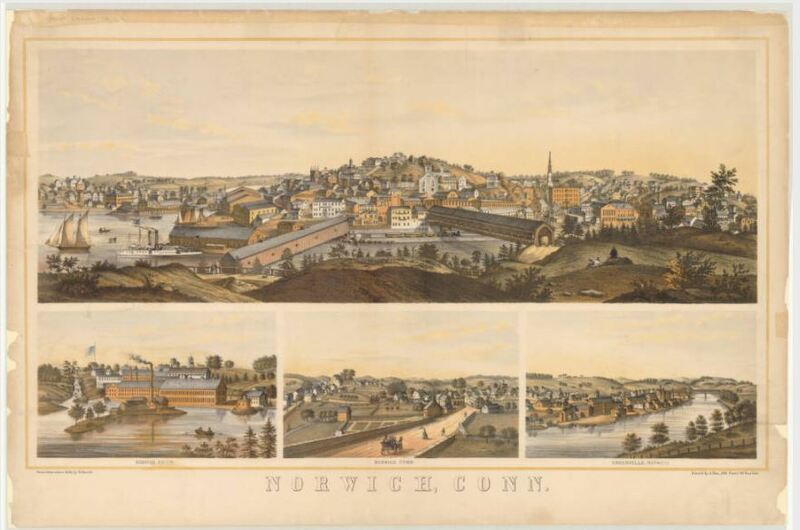 Bird’s-eye view lithographs, such as the one of Norwich (1862) seen here, earned their name because the city or town depicted was rendered as though seen from a high vantage point. Although these prints often idealized the built environment’s virtues and downplayed its flaws, they nonetheless provide historians with useful information. A useful comparison can be made by considering an 1849 view of Norwich, and its emphasis on scenic beauty, with the later 1862 birds-eye view, which focuses more intently on signs of industrial accomplishment. Both depict Norwich as a prosperous mill town and commercial center. Situated where the Shetucket and Yantic rivers meet to form the Thames River, the town was an important transportation center between Hartford and New York City. Travelers found it accessible by ship and steamer, visible in both views at the wharf, and connected by two railroads, the Norwich and Worcester and the New London, Willimantic, and Palmer lines. The 1849 scene is the only Connecticut view drawn by Fitz Hugh Lane, a well-known marine artist and lithographer. The hues of this early colored lithograph and the subtle details, such as the reflection of the boat in the water at right, are typical of Lane’s paintings. His view is more of a landscape print than a detailed scene of the city, as is the case with the 1862 print. The later view was drawn from Laurel Hill looking across the Shetucket River and depicts Norwich as the proverbial city on the hill. Two covered bridges lead into the city, like spokes of a wheel entering the hub, and under them passes a train on the Norwich and Worcester Railroad. Three large vignettes emphasize the importance of mills to the industry of Norwich: Norwich Falls (left) was the site of the Fall Company cotton mill on the Yantic River; Norwich Town (center) was where the houses of the mill owners stood; and Greenville (right) contained the multifamily dwellings of the millworkers and the Shetucket Company cotton mills on the Shetucket River.